Product #1444 | SKU 1767825 | 0.0 (no ratings yet) Thanks for your rating! The ZEISS Planar T* 50mm f/1.4 ZF.2 Lens for Nikon F-Mount cameras is a bright and compact standard lens with precise manual focusing with a large rotation angle for precise control. 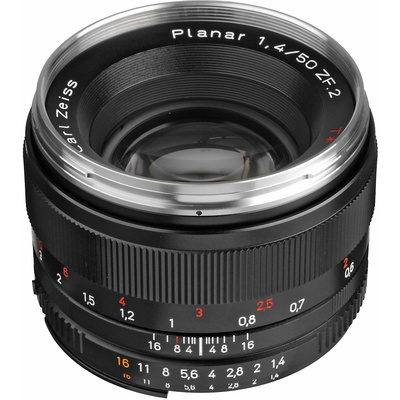 The Planar T* 50mm f/1.4 is designed for medium and longer distances and provides high-performance when used wide open, and improves as the lens is stopped down. The lens construction controls flare and ghosting artefacts, resulting in a brilliant image with excellent contrast and natural colour rendition. Combined with a DSLR with a 1.5 crop factor, the lens becomes a compact, lightweight 75mm portrait lens. For technical reasons, these lenses do not have a half-step aperture lock between the lowest (stop position) and the second lowest aperture setting. This guarantees reliable recognition of the automatic position. The lowest aperture on ZF.2 lenses is coloured orange to emphasise the automatic position of the aperture ring.